The stem of this pipe is wrapped with burgandy wine suede leather and has three white rabbit fur wraps. .
Each fringe has silver beads and glass crow beads and is tipped with a silver cone. The fringes are decorated with grouse tail feathers. 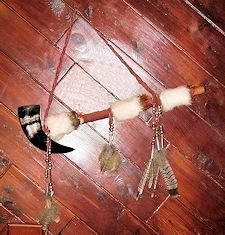 There are also gold and red pheasant feathers along the stem of the pipe at each fur wrap.